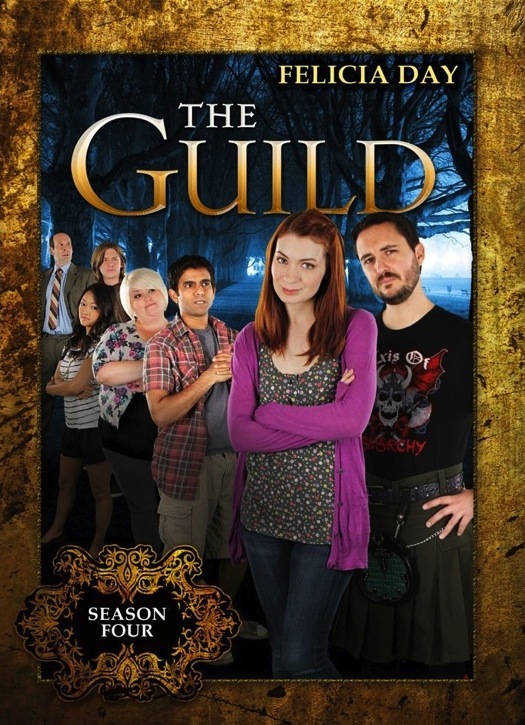 Update: The Guild S4 DVD for Christmas? Last week The Guild was available on Amazon.com and Amazon.ca with a February 2011 release date and I ordered mine then. For people in the US and anyone else who can order from there you now have another option - there is now a DVD-R option you can order here that is available to pre-order and it will be released on the 21st of December. Dreaming of a Guildie Christmas? The DVD-R release is exactly the same as the DVD release in terms of content, except that it will be produced on demand (see Amazon's information about DVD-Rs). That means we can gets our hands on Codex and co that bit quicker - who wouldn't want Codex in their stockings on Christmas Day [insert more puerile attempts at humour here]? In an update yesterday on WatchTheGuild.com, there was also more information about the trade paperback edition of the original three-part comic from The Guild. This new edition has all three comics bound together along with extras such as sketches and words of wisdom from The Guild's esteemed director, Sean Becker. If you ever dreamed about having a part in a webseries - read on! We are running a competition over at MindMyBrains.com where you could win a part in this new webseries - and you can take part no matter where in the world (or beyond) you live. The only thing you need to have is access to some basic sound recording equipment. We've released both the teasers on YouTube now, so if you haven't seen them yet, enjoy! The Guild Season 4 DVD now on Amazon for Pre-Order! The spanky new DVD cover for The Guild Season 4! I have word that there the DVD might be available for Christmas - look out for more news soon!! (You might want to wait for the announcement before ordering). The good news is you can pre-order now! The not-so-good news is that it's not available until February 2011 (according to Amazon.ca). The best news is that there is 30% off the price on Amazon.ca now - only $10.49 (regular price is $15.08). "Hot off the cliffhanger to Season 3, Codex (Felicia Day) scrambles to justify her impetuous encounter with Rival Guild Leader Fawkes (Wil Wheaton) to herself and her Guild. In-game, it's Guildie vs. Guildie when Vork announces a fundraising competition for design rights to the new in-game Guild Hall. Meanwhile, Zaboo and Vork deal with a real-world house guest, Tink and Clara pair up to make some quick cash and Codex's computer problems force her to work at a real job (OMG) with Bladezz (OMFG!). This unrated DVD includes all 12 episodes from Season 4, the hit music video "Game On!" and exclusive bonus material not available on the Internet. Exclusive Bonus Material Includes: Cast Interviews, "Game On" Music Video, The Making of "Game On," Cheesybeard's Commercial, Audio Commentary with the Cast, Audio Commentary with the Creator, Director and Producer, Gag Reel, Table Read, Seasons 1-3 Recaps, Script PDF File, Play All Feature, English Subtitles." Sounds like another packed DVD! Even though I've seen all the episodes many times (and reviewed them all on PinkRaygun.com) I'm still buying the DVD for the extras. In fact - I've pre-ordered already! It's not yet available on Amazon.co.uk - is it out where you are? Hmm, I'm an Amazon Associate, so if you click on links like the one below and purchase I get a teeny % back. When I started writing this article the price was $14.99 but looks like the US site has now applied a 26% discount BUT see UPDATE (above) it might be better to hold off ordering until the upcoming announcement. In an announcement today, the International Academy of Web Television revealed some of its plans for the future which include detaching from The Streamy Awards and creating their own awards due in Fall 2011. This has been met with surprise in some quarters, but most of the reactions I've seen have been positive. And the IAWTV and members have stressed that the parting is amicable and based on how best the IAWTV can serve the community. "...This change will allow the IAWTV to focus on investing all of its efforts into providing valuable resources to its membership. Three months (six for veteran board members) and dozens of meetings (between the board and all the committees) later and I am confident that we are on a path to creating an organization that will provide great value to our community as a whole. .."
"... Non-Profit vs. For-Profit: Due to the IAWTV’s legal structure as a non-profit entity with the mandate to serve the community for which it was established, all profits from an award show in which the IAWTV is involved should go back to the Web television community through programs and resources established by the IAWTV. The Streamy Awards is currently structured as a for-profit entity. We have found it impossible to harmonize these competing objectives and desired ends. · By the Community, For the Community. IAWTV membership is growing now that open enrollment is in place. We have an awesome Executive Director, a fantastic, professional Board of Directors, and terrific members taking leadership roles at a grass-roots level. Due to these realities, we agreed producing our own awards event is possible and makes sense. Therefore, we believe it is important that the IAWTV create a non-profit award show for the community, by the community that benefits the community. · Financial Responsibility. The primary obligation of the Board is to do what is financially responsible for the organization. We have very limited funds presently at the IAWTV. If we were to work with a for-profit entity to produce an ambitious event for the sake of maximizing profits, we would likely put the IAWTV under severe financial stress. We decided it is best to live within our means and not spend money we do not have..."
"...My biggest hope with this change is that we can move on and focus on how the IAWTV can serve the community at large, to help and educate people who want to make their own content, but need more tools. Opening enrollment to EVERY qualified member recently was a big step. There’s a lot of mobilization with the current members to form writing groups, producers groups, creation of a new website to connect members from around the world etc. THERE is where the future of the non-profit IAWTV lies: in servicing the members. And if we can have a low-key awards show to honor the members of our community for their talent, then that will be the icing on the web video cake...."
Liz Shannon Miller broke the news on NewTeeVee with the headline "IAWTV Dumps Streamys For Its Own Award Show". Reading through the article and those above, though, it seems that rather than simply 'dumping' The Streamys, the IAWTV have taken some tough decisions and come up with some solutions that should best serve the community. It has been a long six months since The Streamys and during that time, like many people, I've been doing a lot of thinking, trying to work out what has been going on and what role I want to take (if any) in this community. I love creating, commenting and being part of the new media/webseries world, and I've made some amazing friends in the process. I wouldn't be making a new webseries if I wasn't committed. I held off applying for IAWTV membership because I simply had no real clue what I was signing up for. The path still isn't crystal clear but I am very happy with this announcement and the direction things seem to be going in. I'll be applying to the IAWTV next week. If I get in I will take an active part in the forums and discussions because this community excites me, fires me up and inspires me. You can discuss this over at the IndieIntertube 'Backchannel' message board, where several people have already commented.